When the sport debuted in Sochi, the U.S. came out fighting with a 10th-place finish. But the women couldn't match those results in Pyeongchang. What happened in those four years -- and what does the future hold? Poor course conditions in Sochi resulted in three training sessions being scratched, causing the women's downhill World Cup race to be canceled. The Kazakhstan Olympic Committee says four-time Olympian Alexei Poltoranin is among five skiers arrested in Austrian police raids targeting an alleged doping network. The International Olympic Committee has added seven events to the 2022 Beijing Winter Games, creating a program of 109 gold medals. Sara Takanashi, who set the all-time ski jump win record with her 54th World Cup win on Saturday, extended that record with her 55th win on Sunday in the finale. Sunday's highlights in Pyeongchang: South Korea looks for first women's curling medal, Germany vies to sweep the 4-man bobsled and figure skaters show off their skills in the exhibition gala. Friday's highlights in Pyeongchang: Russia's Evgenia Medvedeva and Alina Zagitova fight for gold in women's figure skating, while Martin Fourcade seeks his fourth Pyeongchang gold in men's relay biathlon. Robert Johansson nailed a leap of 136 meters with the final jump to give Norway victory in large hill team ski jumping and its 11th gold of the Pyeongchang Olympics. Monday's highlights in Pyeongchang: Canadian ice dancers Tessa Virtue and Scott Moir go for their second gold in their final Olympics and USA takes on Finland in a women's ice hockey semifinal. American Nick Goepper wins silver in the men's ski slopestyle event, finishing behind Norway's Oystein Braaten and ahead of Canada's Alex Beaulieu-Marchand. American Gus Kenworthy finished last. Kamil Stoch won ski jumping's large hill event Saturday with leaps of 135 and 136.5 meters at the Pyeongchang Olympics. Normal hill gold medalist Andreas Wellinger of Germany took silver. After dominating the ski jumping World Cup this season, Maren Lundby overcame frigid temperatures Monday to win the women's normal hill gold medal at the Pyeongchang Olympics. German Andreas Wellinger won the men's normal hill title Saturday at the Pyeongchang Games despite the frigid temperatures and whipping wind at the Alpensia Ski Jumping Center. He nailed a jump of 113.5 meters to secure the gold with 259.3 points. In the first full day of competition at the Pyeongchang Olympics, the first five gold medals will be awarded. What was the biggest question leading into the opening ceremony in Pyeongchang? Everyone wanted to know if Tongan Pita Taufatofua would show up shirtless and oiled up. He did not disappoint. 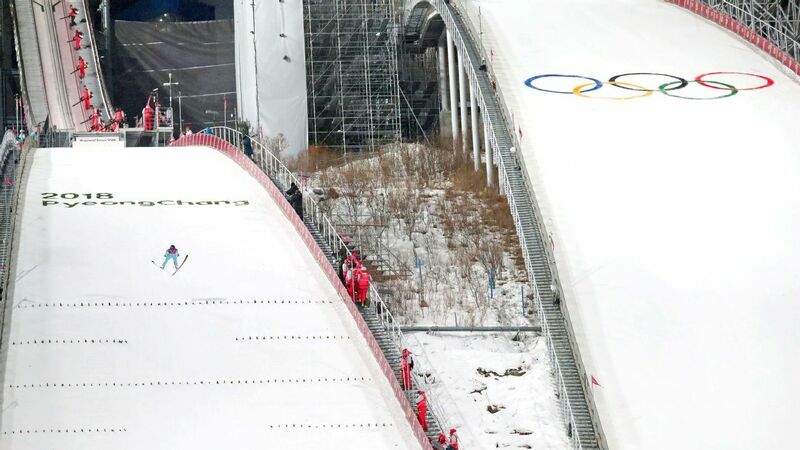 According to a leading authority on the history of the Olympics, U.S. ski jumper Casey Larson -- making his debut at Pyeongchang -- is the 100,000th man to compete in the Games. So many athletes and events to follow in the Olympics ... Where to start? We've got you covered. Here are the biggest names and biggest storylines playing out in South Korea -- and when you can catch them. Daniel Andre Tande of Norway claimed his first big international title at the ski flying world championships Saturday. Maren Lundby won her fourth straight World Cup ski jumping event Friday, building on her status as the gold-medal favorite for next month's Pyeongchang Olympics. Kamil Stoch of Poland rounded out his second straight Four Hills Tournament victory by also winning the last stop Saturday. Defending champion Kamil Stoch saved his best for last to win the first ski jumping World Cup of the 66th Four Hills Tournament on Saturday. Yuki Ito led Japan to victory in a women's ski jumping World Cup team event Saturday at Adler Ski Stadium.